Oh Rebel Boss Ladies, you are going to LOVE this episode. I hopped on a chat with my good friend Emily McGee to chat all about her business. Right now, Emily is juggling two kids, two businesses, and a full time job. Yes, she's STILL managing it all and that's because she's an absolute WIZARD with her time. Join us for this episode where Emily divulges her time management secrets and talks about her ebook sales! About two and a half years ago, Emily started her first blog. She had recently left a stressful job, was pregnant, and was living in Mozambique, a country in Africa. Emily needed a portable and flexible job, so she jumped right into blogging. That's when she started MyAdaptableCareer.com – it really was the perfect flexible, portable thing for her at the time to help add to her family finances. Fast forward to today, Emily runs two websites, and works full time for a software company online. Emily found a full time job that is entirely remote, which means she doesn't have a commute, doesn't have to worry about makeup in the morning or getting dressed up. That saves a lot of time! She also doesn't own a TV, which means that in her spare time, she works on productive stuff! After putting her two kids down to sleep at around 7:30 in the evening, Emily uses the nighttime hours to progress her business. Many bloggers are afraid to do this. They feel like they can't spend money unless they're already making money or feel like they MUST do it all themselves. Emily is a huge advocate against this. A perfect example – a babysitter! Emily and her husband hired a babysitter to come at 5 hours on Sunday afternoons. This helps her use that time to focus on business, and also to take care of herself. Emily says this is so worth it in terms of her sanity and also her business. Hiring a cleaner is another way to outsource personal tasks that have absolutely no ROI. Emily spends a ton of time planning in advance and ruthlessly prioritizing. She identifies tasks that MUST be completed and cuts out everything else. Workflows are easy systems that help you get more done faster without needing to think about how to get something finished. It's hard to accept that you're not going to have the time to do everything you want to do. But you just need to go easy on yourself and embrace the feeling that you're never going to get it done. Emily currently has one printable planner, three ebooks (which are really more like planners/workbooks), and two courses. She arrived at this portfolio by using blogging to build her audience and grow her email list before launching anything. She didn't launch her digital product until a year after starting her blog – this was a mistake! Her next mistake was creating a course first, instead of something that would have been faster and easier for her, like an ebook. Search through comment threads on relevant Facebook groups and snoop on conversations in there. Check out your high traffic blog posts, since those might clue you into a lucrative opportunity. Explore your social media posts. What's driving the most traffic? Is there a pin that is really taking off? This was the case for Emily, and a viral pin pushed her to create an entire online course to sell. Emily mentioned that creating a course first was a big mistake. When I asked her to explain that a bit more, she said that creating a course was not fast and easy for her; writing would also be easier for her. I loved that Emily brought this up because it highlights the point that when something is particularly challenging for you, it can be easy to procrastinate and waste a lot of time. Also, if you do experience failures in your launch, creating a product that doesn't take a lot of time means that you didn't waste a whole bunch of effort on something that flopped. Emily identified that her most lucrative products are her $19 ebooks, rather than her $197 ecourse. Smaller products do better for a lot of bloggers because many consumers are tired of big, expensive course and just want to buy a small, quick solution. Less expensive products can also easily be sold to a cold audience that don't need a lot of warming up. Emily is running Pinterest ads directly to a sales page for her ebook and is seeing great success from this, making around two to three sales per day! People often procrastinate because they are scared. Saying you need an audience is a gentle excuse for not launching a product – because launching a product is really scary! When Emily launched her first course, she only had about 230 people on her email list – not that big! With Emily's second business, she launched her site with three products already created. In Emily's mind (and I 100% agree) if people come to your site, why should early visitors miss out on a solution that you have to one of their problems? But when you sell a product, you are providing them with an opportunity to solve that issue and that is GOOD, not sleazy. Emily always starts with an outline, which helps her ensure that she isn't missing anything. It's also really helpful to see the big picture. Later on, when creating the sales page, Emily will also come back to the outline for help with copy. During the outline phase, Emily is working in Google Docs and she's not at all concerned with beauty, formatting or anything else. She works to perfect the content before she moves on. Next comes the design phase. Emily purchased an ebook template from Station 7 since she is not the greatest at design. She simply cuts and pastes the ebook into that template, and it's done. Emily finds the hardest part of the creation process to be the sales page; this is due in large part to the fact that she is teaching things that she already knows really well. So it's really easy to put it on paper and share her knowledge. But creating the sales page is not easy for her since she's targeting people whose pain points are not her pain points. To help, she keeps sticky notes on the side of her desk that include quotes that she has heard her customers say before. She also uses a template for her sales page and a template for the design. Emily also emphasizes that the longer the sales page the better – so don't skimp on that sales page even if it's for a cheaper product. People want a long sales page so they can get a ton of information. Can you sell a product that is also available for free online? Emily says yes but it's hard to do, so be careful. Always tweak your product as much as possible to put a unique spin on your products. You need to ensure that you convey the value with your product. If your value proposition is not any different than that of other free alternatives, you'll lose the sale. Emily says that the busier she is, the more she is forced to prioritize. Yes, this means a lot of stuff gets left behind and unfinished, but since starting her job in April, her income generally has stayed the same. She is still only focused on the money making stuff, instead of wasting time on fluff that didn't translate into income. After starting her full time job, Emily also started her second business. 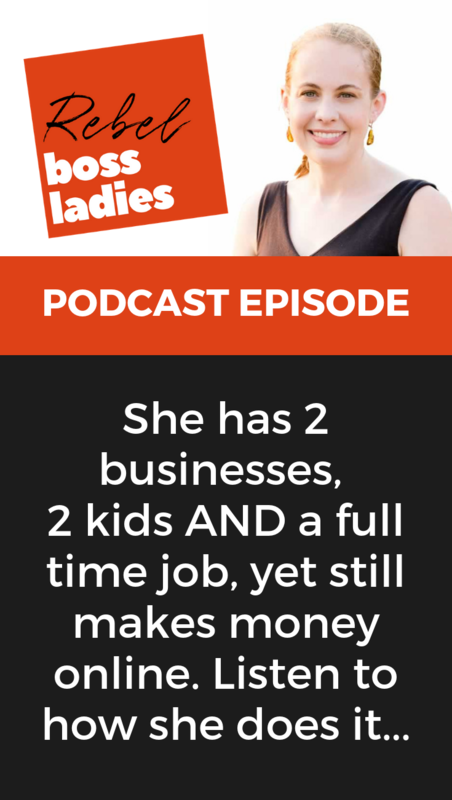 She managed not only to juggle a new full time job, her existing business AND start another – if that's not inspirational is, I don't know what is!